Gray Canvas Storage Cover. 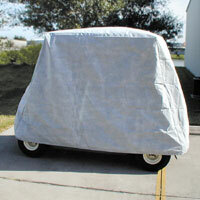 Protect your golf cart from the weather when its not in use. This canvas storage cover is water resistant and meldew resistant. Draw string sewn into the bottom hems. Fits most golf carts with standard top or optional 80 Inch extended tops & carts with rear seat kits.